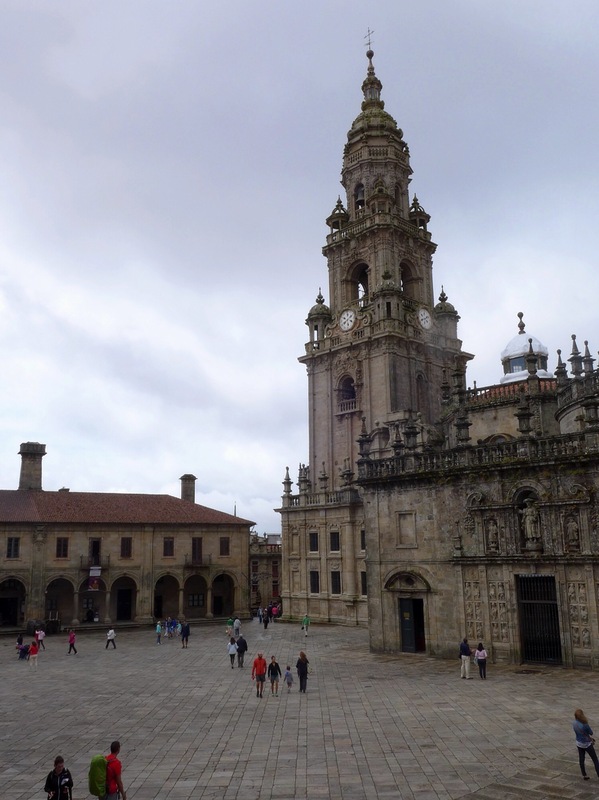 Waking up the day after in Santiago de Compostela, my first instinct was to get ready for another day of running. 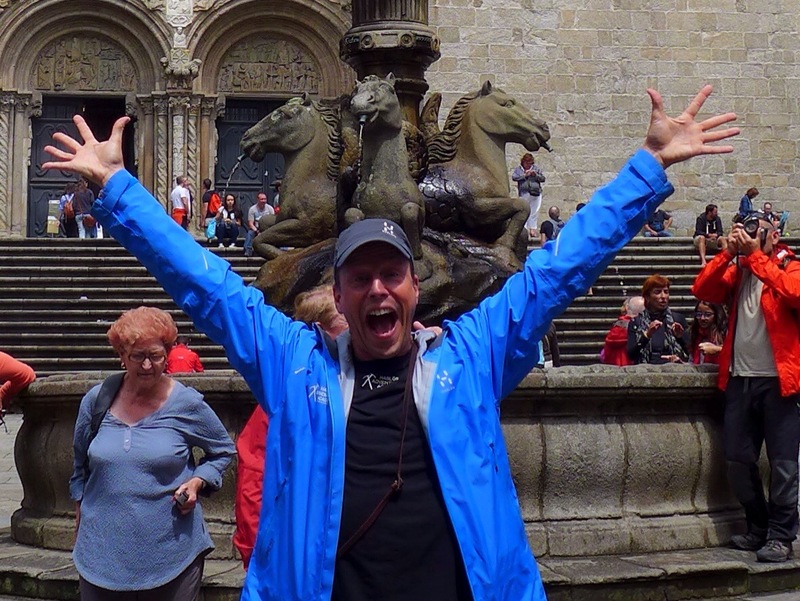 I was trying to remember the distance for the day when it dawned on me that I was not going to run this day because I had arrived to Santiago de Compostela! A mixture of joy and sadness came upon me. Happy to have reached my target, but also sad because it was over for this time. I did my morning routine of going through everything and then getting ready. Still it felt different, no running. Feet were feeling ok, blisters under control. No muscles torn or ligaments hurting. But I did have a funny way of walking on my stiff legs. 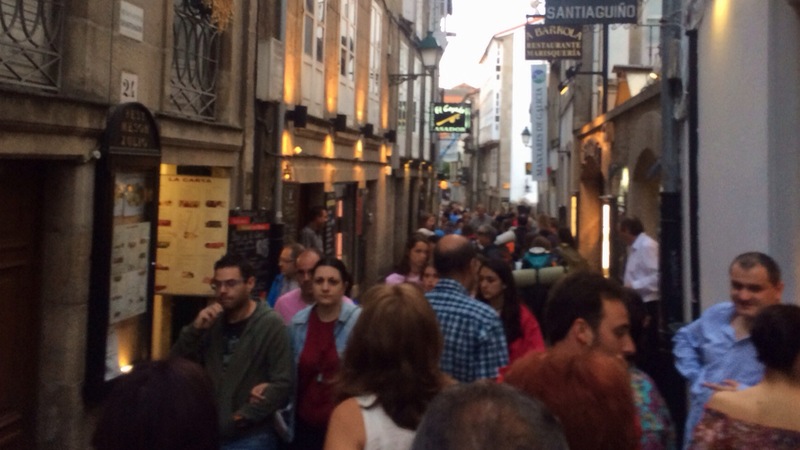 Busy streets and pilgrims arriving all the time. I was struck by the fact that there were so many people and all very happy. We ran into a group of singing wanderers just arriving. Beautiful voices and lovely people. The center of all activities were in the old part of the city. 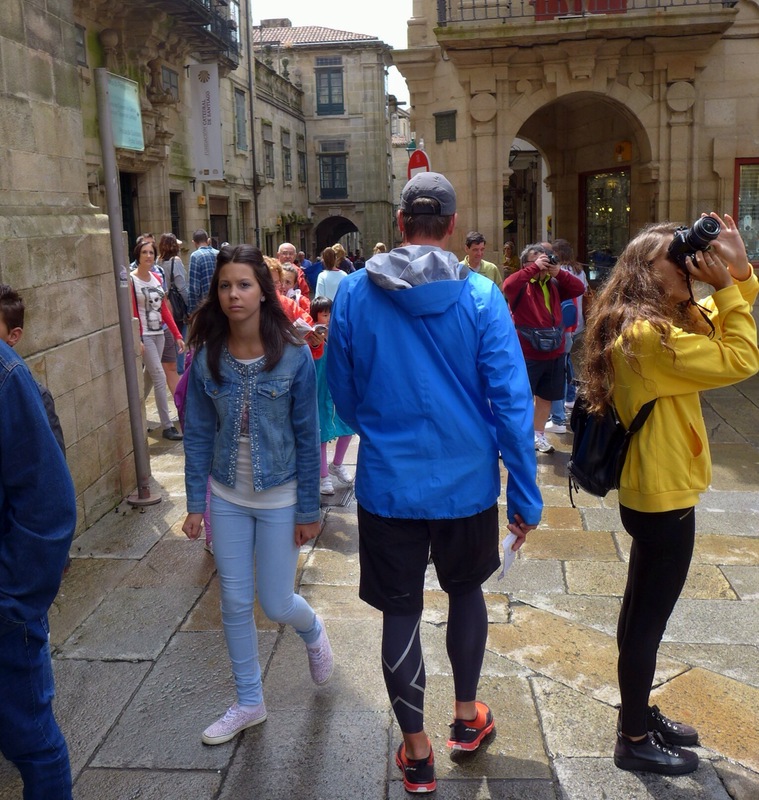 Many small streets full of people visiting, arriving and also some leaving to continue on their journey. Amazing contrast to be in such a crowded environment after being alone out on the path for eight days. Seeing the basilica in daylight was impressive. It was huge! Wide building and tall towers. 220 000 people from all over the world wall, ride or bike here each year. Not always a spiritual reason, but all with one thing in common, to reach this church. 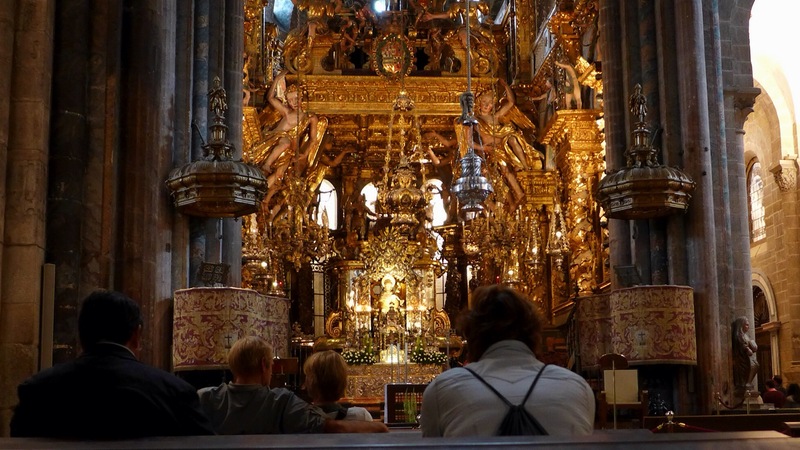 Inside there was the golden centerpiece with the figure of St Jacob in the middle. Behind it was a small passage where the people could enter to embrace or hug him for a blessing. On the sides of the church there were many chapels for prayer and contemplation. Time to go to the Pilgrimage Office with my credential. The woman behind the counter asked me why I had done this journey, ’Was it as a physical challenge or more of a personal or spiritual reason.’.I told her about the adventure, Crossing Borders, running the Camino Primitivo and about the fundraiser for Doctors Without Borders. I thought of all that I had experienced and seen and concluded that it was both reasons. She went through my stamps in the credentials, verified the dates and places. Then she signed a certificate for me and Congratulated me on the conclusion of this journey. There it was, the official completion of my expedition. It was now officially approved!! 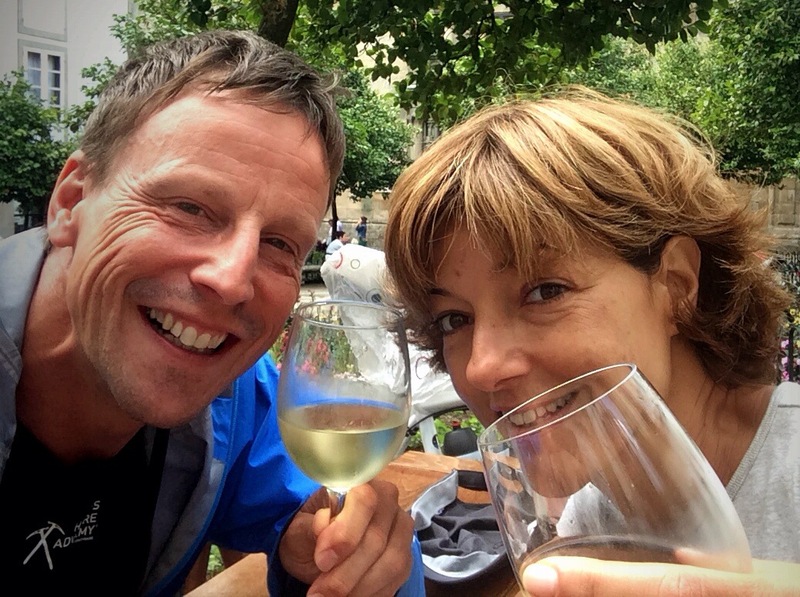 Outside again, smiling, time for lunch and to celebrate the completion of Crossing Borders’ objective to reach Santiago de Compostela in 10 days by trail running the 330km Camino Primitivo. I managed to do it in 8 days in a safe and controlled manner. Felt great!! A full day of rest and recuperation was much needed. Much more than I was aware. That evening I slept well. Next day we left to go back home. The adventure was now officially over. 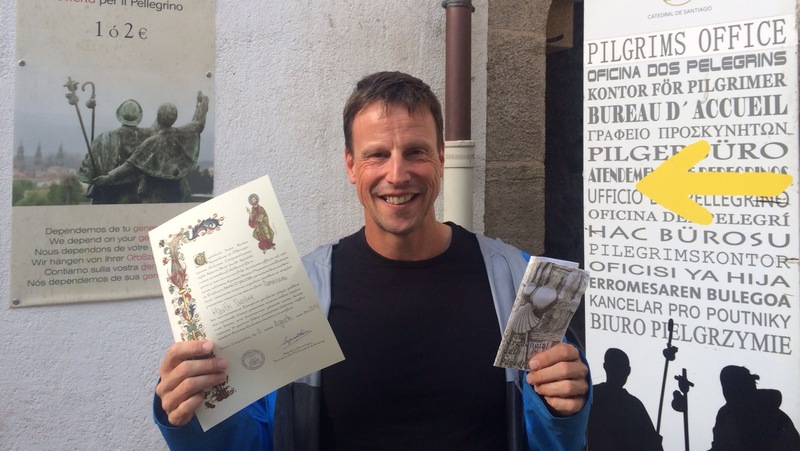 So grateful for all the encouragement and support, which I have received before, during and now after my expedition. The donations to the fundraiser have been heartwarming. These are much needed for the work of Doctors Without Borders. Thank you!! Wish I could hug you all! 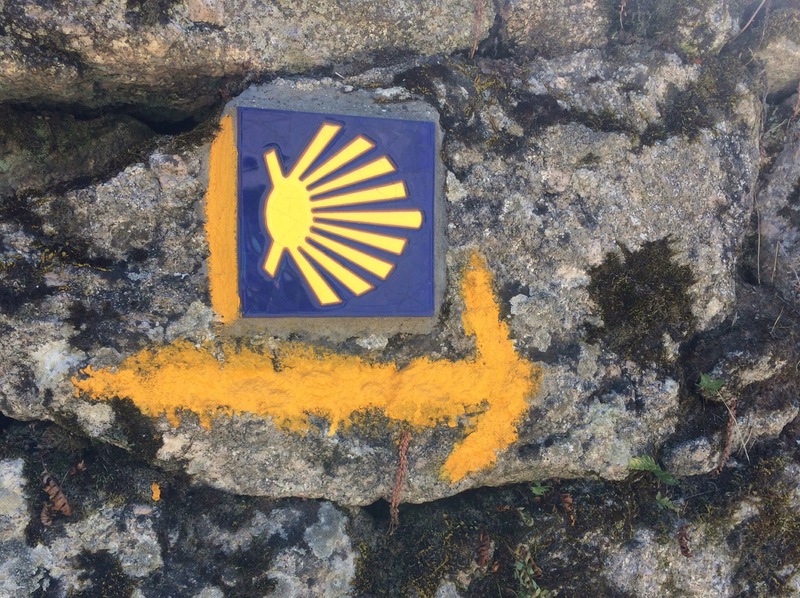 And remember if you want to go to Santiago de Compostela, just follow the yellow arrows and the sea shells. Buen camino! !